Since arriving in South Korea, everything we’d experienced had been fantastic. We had no reason to think Seoul Lantern Festival would be any less impressive. The festival is celebrating its 10th Anniversary in 2018 and attracts around 2 million visitors. It. Was. Fabulous. Despite the festival being in the centre of Seoul, as the lanterns are displayed on a canal just below street level, it has a real air of calm about it. Don’t get me wrong – it’s busy, but it’s not too crowded and the photo opportunities are plentiful. 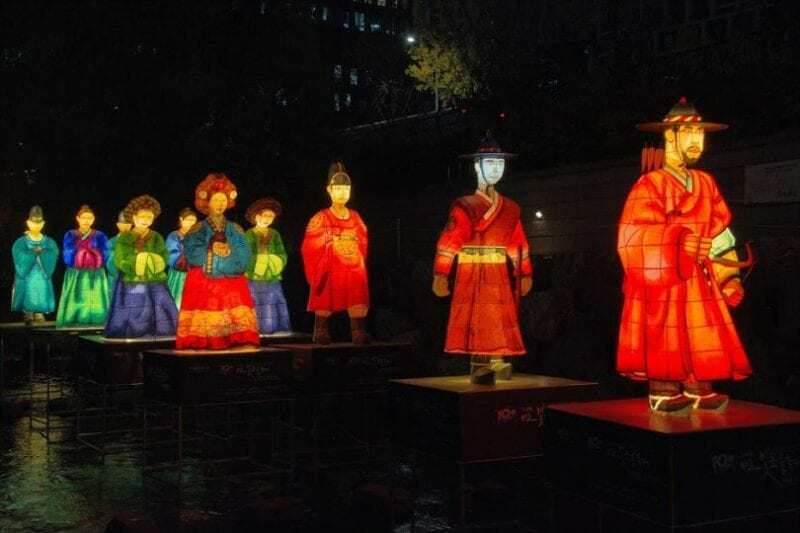 Admission to the Seoul Lantern Festival is free of charge. Departing from the main city station, this section of the festival lets you live like a local, showing you some of the amazing things Seoul has to offer. This section showcases some of the amazing things the city has achieved. These include the fabulous DDP Design Plaza, advances in virtual reality, the age of robots, sky cars and delivery drones, amongst others. Seoul’s memory lane is a brilliant way to get to know the city and its history. From Seoul’s changing fashions, child’s toys, transport and tourism; this is a look back at the things that made the city what it is today. It’s also in this section that you can wander through the wonderful tunnel of light. The lanterns in this section of the festival concentrate on the traditional heart of Seoul; including the rich culture of South Korea. Check out amazing traditional dress and dances, the Royal Family, traditional Korean weddings, in addition to a host of other lanterns to guide you through Seoul’s past.